Here is my code directly from SC, before posting. As you can see, without a space at the end of the line. 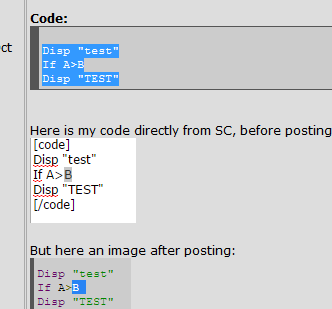 When I copy that code back to SC, I must remove all the spaces at the end of the lines. Cannot replicate. Edit: Firefox 37.0.2 on Windows 7. Can replicate. Chrome 42 on Windows 8. Happens to me on Win7 with Chrome 43 and IE9, but not Firefox. Looks like it's a Webkit issue, I can replicate it in Safari but not in Firefox on the same computer (OS X 10.10.3). Well, because I heard it more times, I had created a special website that removes the spaces for you. Instead of removing each space, which costs much time, simply copy your code in the textbox and click on the button; now you can copy it to SourceCoder or whatever. I have tested it, and it works properly. Have fun with it! Do the spaces happen every time someone sends a program file to SourceCoder 3? It has happened to me only once. It's not an issue at all, really. It's just in the way certain browsers handle text. I assume in this case it's how webkit (e.g. Chrome, Safari) handles monospace font. IE11 appears to demonstrate the same behavior. I suspect what's at fault is how phpbb handles newlines. Here I have the space following "test" in the OP and preceding the line break highlighted in the DOM browser. You can see the same thing easily in the original page source. hexdump shows there's a full CR/LF in which I assume not-Firefox browsers are treating the CR as visible whitespace. I suspect you're right. I did some basic testing with other sites and the phpBB site doesn't have this issue (though it's phpBB3). I can actually replicate this with non-monospace font; Making my previous post mostly irrelevant. It's because the website doesn't exist anymore Maybe PT_ still has the code so it can be rehosted elsewhere. If you'd like to host that at a more permanent location, I can throw it up on my website. Or... you know... someone could just fix Cemetech so we don't have to use an external tool just to copy code. Can't you just... remove that space? That's clearly the issue. That's just crazy talk. It's been a known issue for quite some time, obviously it is not high priority. [2016-03-30 14:11:05] <KermPhD> Sure they do tabs! [2016-03-30 14:11:11] <KermPhD> Only Chrome adds that a extra space. © Copyright 2000-2019 Cemetech & Christopher Mitchell :: Page Execution Time: 0.285715 seconds.